Welcome to World Prod Co.,Ltd. World Prod Co.,Ltd. was established in 2010. Our team has expert in Air Compressor system industrial. Especially We had selected Air Screw Compressor (SCR – Shanghai Screw Compressor) from China with USA. Technology. Our products have reliable and high quality in China and worldwide the products are exported to many countries around the world. We realize in the good quality, best after – sale service and reasonable price. We hope to use our experiences in the air compressor system to supporting all industries correctly at the lowest cost for increase ability in business competition presently. Presently, Thailand market still lack of innovation and technology to solve energy & environmental problems in water cooling treatment system such as Chiller, Cooling Tower. 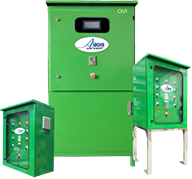 In 2016 We presents the “Aiacos” is scale remover, moss and sterilize in water with ozone technology. Moreover our team has many experience and expertise for more than 10 years in this business therefore, we are confidential that can help you to reach your goal. Ozone generator. How does ozone work Click! !